This has been my favorite sunscreen for 25+ years! I love it because it's tropical coconut scent smells soooo good, it isn't greasy, absorbs quickly, and works great. It smells so good and moisturizes my skin so nicely that I like using it as a body lotion too. I recently got to L'Oréal Paris Advanced Haircare Extraordinary Oil Shampoo, Conditioner, & Lustrous Oil Serum free in my @Influenster #ExtraordinaryHair VoxBox. I like them. They leave my hair clean, soft, shiny, frizz-free, more manageable, and smelling great. And I'm happily surprised that they don't leave my hair oily or greasy, and are so affordably priced between $4.99 and $6.99. Overall, I like this line. I plan to continue using it. 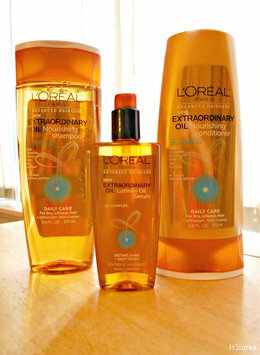 And I would recommend it to anyone, especially those with dry hair. I like using Instagram, it's a fun way to share my pictures and to view other people's pictures. The only thing I slightly dislike is that pictures can't be added and edited via computer, that can only be done via cell phone and tablet. I've stayed in a few different Marriott locations and have always had good experiences. The rooms are spacious and clean, nice amenities, good customer service, and convenient locations. I always use travelocity when I'm planning a trip and to check for an affordable deals. The site is fairly quick and easy to navigate. I like that it gives me the option to find flight, hotel, car rentals, cruise, & things-to-do deals individually OR groupings of flight+hotel+car, flight+hotel, flight+car, or hotel+car package deals. I recommend Travelocity as one of several travel deal sites to check for good deals. Amaretto Liqueur is one of my favorite liquors to use in cooking/baking, especially at the holidays. It's got a smooth, sweet almond flavor and can be used in a variety of yummy ways. I love it used in Amaretto cake and homemade chocolate truffles. I recommend it to anyone interested in trying it. And I'll definitely continue using it. I love Malibu Rum, it's one of my favorite liqueurs. It has such a yummy sweet, coconut flavor and is good used in beverages and cooking/baking. I like it in pina coladas, daiquiris, iced or hot tea or coffee, punch, juice, and cola; and in making frosting, cupcakes, & rum cake. I recommend it, and I'll continue enjoying using it. I love Forever 21. They have a wide selection of clothing and accessories, variety of styles, and such affordable prices. It's one of those stores I always find many things I like. They also have great sales and clearance prices. The only slight dislike is when they run out of colors quickly in clothing I want to buy. but they replenish fairly quickly. I had a good experience with Kay Jewelers. They have quality jewelry, a wide selection of items & styles, a variety of price ranges - even for my tight budget, and helpful customer service. I recommend Kay, and will consider it for future jewelry purchases.